Drizzling rain on Wednesday afternoon cleared out Cacciatore Stadium for a 40-minute delay in the third inning and the mood remained DePaul (30-15, 12-3 Big East) competing against the Northwestern Wildcats (33-14, 13-6 Big Ten), as the Blue Demons dropped their final regular season home game 7-3. Significantly, this game was the first since 2006 in the DePaul-Northwestern rivalry where the road team came out victorious. Coming into this matchup, the Wildcats had won 10 of their last 11 games, while the Blue Demons were riding on a five-game winning streak. 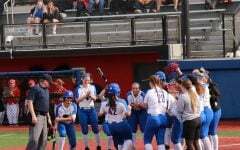 Following the rain delay, the Blue Demons quickly came out of the gate and took a 2-0 lead in the bottom of the third inning. 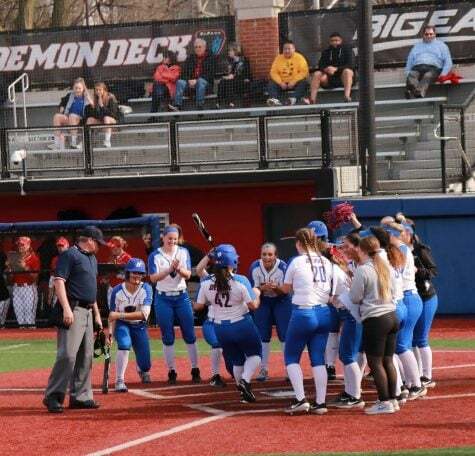 They were assisted by a run from freshman Skylor Hilgor, who scored off an error by Wildcats’ centerfielder Sabrina Rabin and by senior Megan Leyva’s sacrifice fly that allowed Kate Polucha to cross home plate. 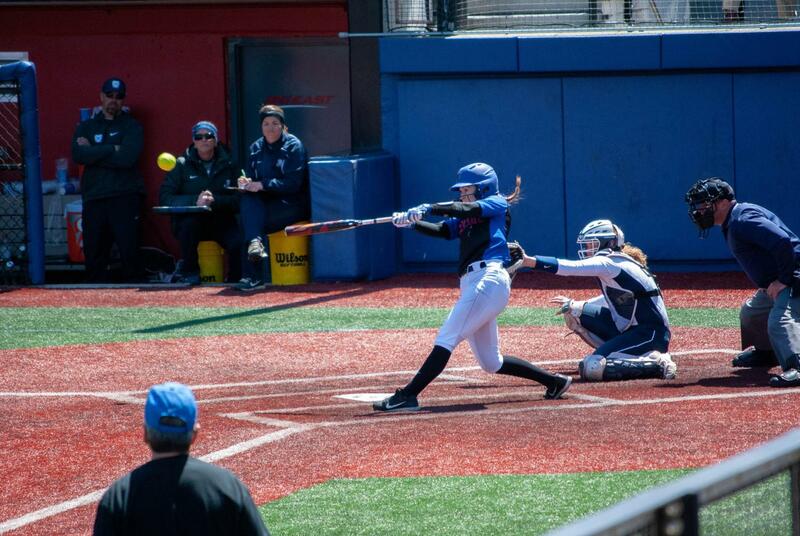 Leyva’s sacrifice fly wound up being the Blue Demons’ sole RBI. 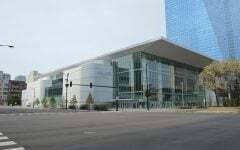 Mother nature seemed to feed into a lack of all-around team focus, which some attributed to the Blue Demons’ collapse. 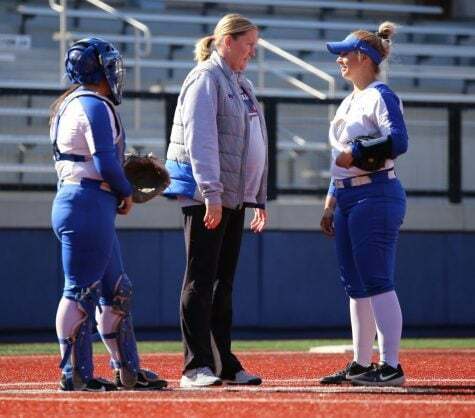 The Blue Demons offense, however, did not hold up with the Wildcats, especially under the duress of pitching changes in which all three pitchers split two-and-a-third innings apiece. 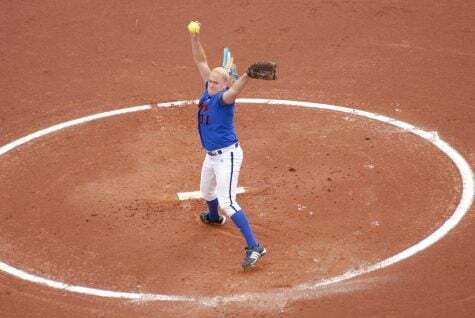 Kennedy Garcia started on the mound and ended up being the team’s most efficient pitcher by not allowing any hits and striking out two batters in only 34 pitches thrown. Once Garcia’s time was up, Lenti called on freshman phenom Pat Moore to take on pitching responsibilities. But Moore, who has an 11-5 record this season with a 2.05 ERA, didn’t look as comfortable on the mound. Despite tossing two strikeouts, Moore uncharacteristically gave up four hits in 10 at-bats. At that point Moore ended up exiting the field for freshman pitcher Missy Zoch who has a team-high 13 wins for the season. Unfortunately, this became the Wildcats’ time to shine in the eventual overcast conditions. 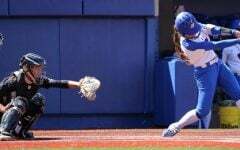 With two Wildcats on base, junior left fielder Morgan Nelson blasted the softball deep over the left field fence from a three-run homerun to give the Wildcats the 3-2 lead. 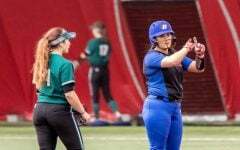 Zoch pitcher her way out of the fifth inning, but ran into even deeper trouble once the top of the sixth inning rolled around, when the Wildcats tallied four more runs to push their lead up to 7-2. 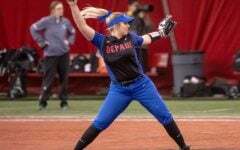 Moore ended up taking the loss to put her overall season record at 13-5 to go along with a 2.06 ERA. 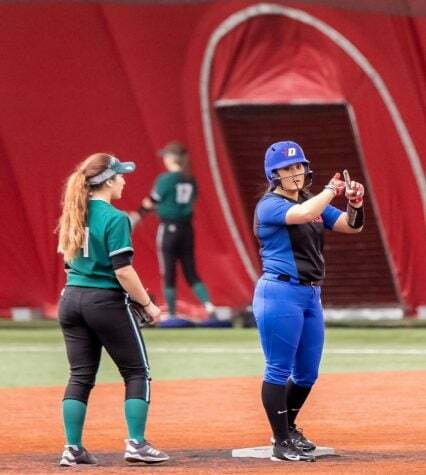 The Blue Demons’ final run came in the bottom of the sixth inning, when freshman shortstop Miranda Gutierrez stole home plate. Even though Zoch’s performance wasn’t stellar by any means, Lenti still expressed confidence in his pitching strategy involving three rotations for two-and-a-third innings split by Garcia, Moore, and Zoch. 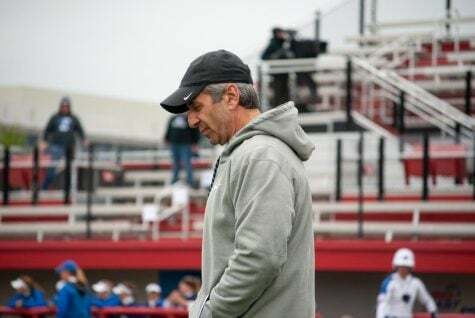 His team will be traveling out east this weekend to face the Providence Friars and then hosting the Big East tournament in Rosemont, IL on May 11-12. 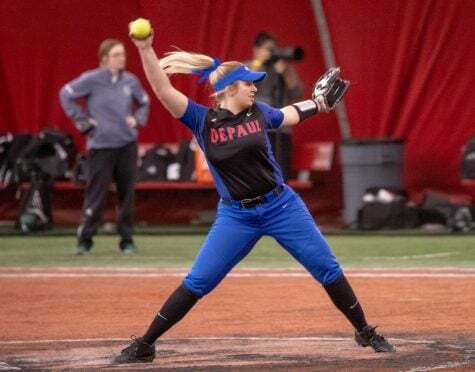 Additionally, Lenti noted how integral of a role his three pitchers have on the Blue Demons’ chances of winning their second consecutive Big East title, while ranking No. 1 in conference play. 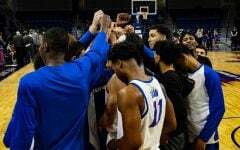 Aside from pitching serving as a key factor moving forward, the Blue Demons are looking to build on their mental toughness as well. 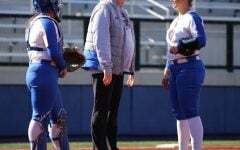 “We definitely have to just keep our mental game strong,” said senior right-fielder Megan Leyva. 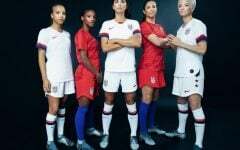 Lenti further stressed the importance of mental toughness and its correlation to taking things on a step-by-step basis.